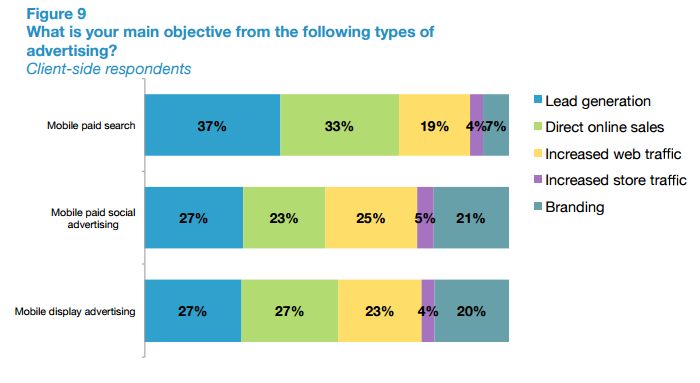 Over a third (37%) of marketers are not even measuring their ROI in relation to mobile display advertising. 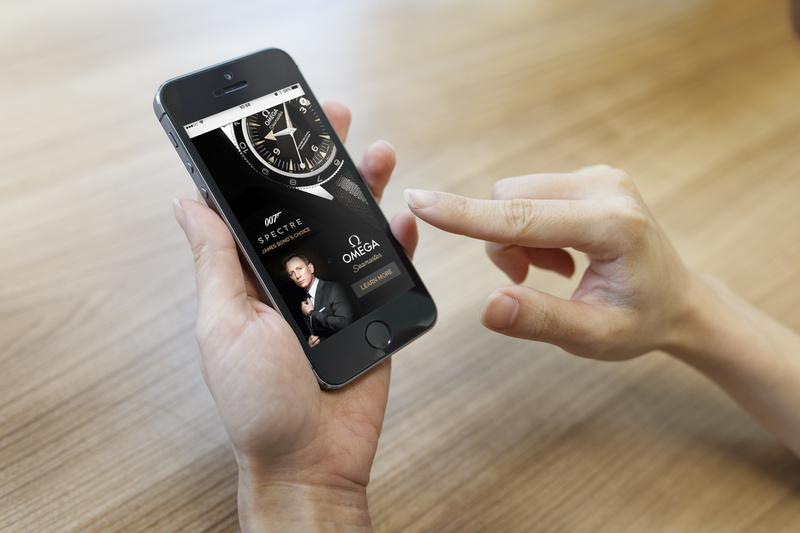 It is no secret that digital is a lucrative marketing channel. Year-on-year digital ad spend continues to grow at an impressive pace. The IAB has just revealed that digital ad spend in the UK grew 16.4% last year, reaching an impressive £8.6bn. This is the fastest year-on-year growth since 2008, signifying that digital marketing shows no signs of slowing down just yet. Mobile makes up for 78% of this increase – growing by 60.3% year on year. In order to understand how marketers – namely advertisers and agencies – utilise and understand mobile in terms of a marketing channel, ClickZ Intelligence recently released ‘The State of Mobile Advertising’ report. The report takes an in-depth look at how marketers view the mobile marketing landscape, observing specific areas of the mobile industry such as programmatic, video and display. In line with the IAB’s finding that mobile display advertising continues to grow at a rapid pace, ClickZ found that advertisers and agencies are extremely likely to increase their mobile budgets in 2016. 54% of marketers stated that they will increase their mobile programmatic budgets in 2016 with a further 49% saying that they would increase their spend with mobile-specific ad networks. 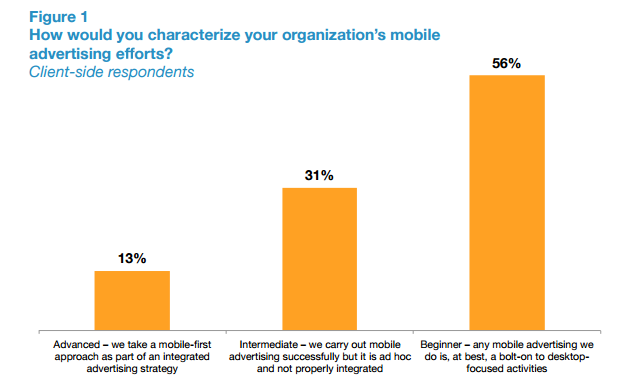 But despite the surge in mobile ad spend, marketers and advertisers seem to be lacking confidence with mobile marketing. The study found that 56% of marketers consider themselves ‘beginners’, admitting that mobile is simply being used as an extension of desktop marketing. What is even more surprising is that just 13% of marketers admit to taking a mobile-first approach with their advertising strategies. For just over 87% of marketers to say they do not have a mobile-first approach is particularly worrying considering how much is being invested in mobile marketing year on year. One of the most shocking take-aways is that over a third (37%) of advertisers and agencies admit to not measuring the success or ROI of their mobile marketing efforts. This makes complete sense in why so many advertisers and agencies are so uncertain about mobile marketing potential if they are not measuring the success of their efforts. One takeaway from this research is that marketers and advertisers are still getting used to digital means of advertising. The amount of knowledge surrounding how to effectively use mobile advertising is out of sync with the reality of how big the industry is. The study highlights that there is a certain element of doubt surrounding the effectiveness of mobile as an advertising channel. For example, many advertisers are of the opinion that mobile is not as effective as desktop, with some stating that desktop is the biggest driver of sales, despite the amount of people using mobile. This then begs the question whether advertisers and marketers are viewing the role of the mobile correctly. Over half admitted to using mobile display advertising for lead generation and driving sales, with only 20% stating they use it to build brand awareness. With many experts in the industry stating that mobile’s main strength is to increase brand awareness and create engagement, maybe marketers have a skewed view on how mobile advertising should be used to its greatest potential. It’s important to remember that the digital landscape, in particular mobile, is a relatively new marketing channel which many are still trying to grasp. Mobile marketing has a long way to go to reach a more sophisticated level, however, we are heading in the right direction – clearly shown by how much budget continues to be invested in mobile each year. If you enjoyed this blog then let us know via Facebook, Twitter or Linkedin. To find out more about how AdSpruce can help you, visit the website here.